How do I use Applescript to click the Replace button in the Photoshop Save As dialog? 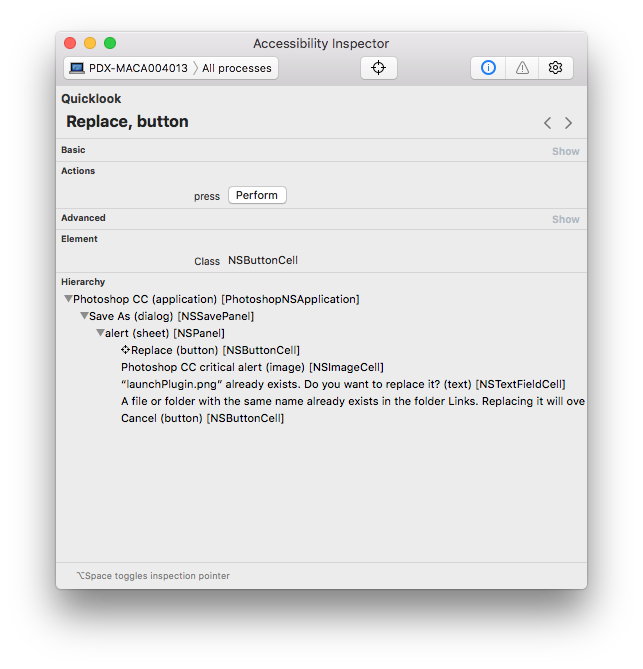 Here's what the Accessibility Inspector shows for the Replace button: I've tried various approaches to identifying the sheet, none of which have worked. Any suggestions? "Save As" of application process "Adobe Photoshop CC 2018"
"PNG Format Options" of application process "Adobe Photoshop CC 2018"
application process "Adobe Photoshop CC 2018"
Not the answer you're looking for? Browse other questions tagged applescript adobe-photoshop . AppleScript - How to identify buttons and press them?